10 years ago sitting at my office, working as a marketing consultant I visualized my future and decided to go for my dream, to become an actor. While studying drama a friend of mine, a wedding planner, called me urgently. “I need you to marry one of my couples. The celebrant we had has disappeared and the wedding is next week!” “Maria, I’m an actor not a priest.” “I know! But this is just a blessing, and you’re a guy that can talk, that knows how to touch peoples hearts, please help!” So, by accident, I became a celebrant and found one of the most ever fulfilling jobs of my life. Why did you decide to move to Mallorca? To be honest it wasn’t my decision. My parents decided to have me here. I like to call myself a mallorcan aboriginee, and so is all my family. That she/he makes you feel comfortable, confident. That there is a good energy flow between her/him and the couple. She/He should be communicative, touching and trustful. It keeps me freshly connected to love. I am also married, for 6 years now, and every interview I have with loving couples, there is always something that fills me in, that makes me remember or discover new sparks, flashes about the loving phenomenon. As soon as you are sure that she/he is the right one. 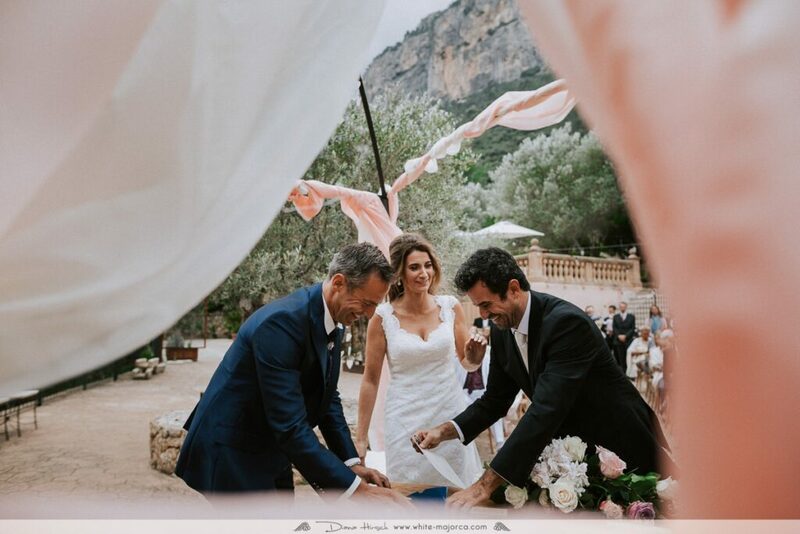 Mallorca is a really popular wedding destination and celebrant agendas do fill in pretty quickly. Absolutely! This is like chemistry. You need to feel that comfy energy between you and her/him. 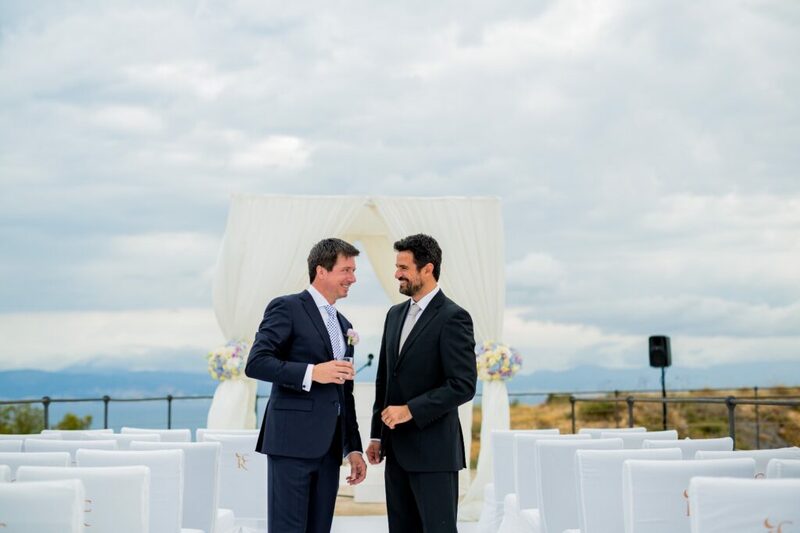 It is going to be one of the most important days of your lives and you must be 100% sure that your celebrant is the best for it. 2 meetings. The first one to see if the celebrant is “the one”. The second meeting will be needed to carry out the deep interview which will help us with the design and content of the ceremony. Just the necessary.You already have so many details to think off, so I am here to help and take care of the hard work! 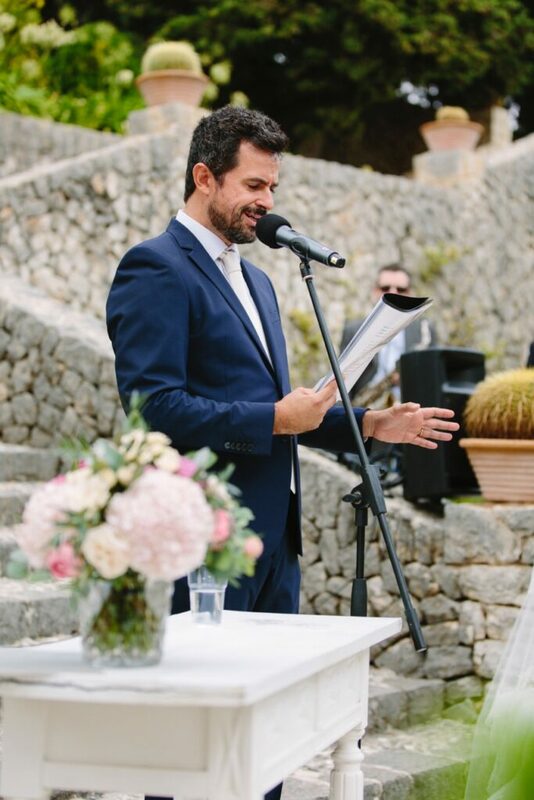 What happens during the ceremony i.e order of readings, when the chosen songs have to be played, call the best man to bring the rings, signing of register etc is all on my side. Other matters such as wedding processional order and seating can be dealt during venue visits. There is no exceptional need for the celebrant to rehearse. On the other hand, I am always available for a rehearsal should you need it. Authenticity, just be yourselves. Your party is joining you to watch you two getting married. They are not looking for anything else, just a true act of true love with true words. The most complicated moment is the start of the event i.e the ceremony. Just relax, look pretty, smile at your friends and family, enjoy this unique moment, all the rest is on me. What sort of behind the scenes work do you do that couples might not know about? When writing the tailor-made script of your ceremony, I’ll be in the comfort of my home, listening to piano music, accompanied by a green tea, revising all the notes I took from our interview. I will visualise your story as it happened, and then choose the right words to explain it. Every single compliment I receive after the ceremony. Do you have any tips for couples planning their ceremony? To choose the right professional. 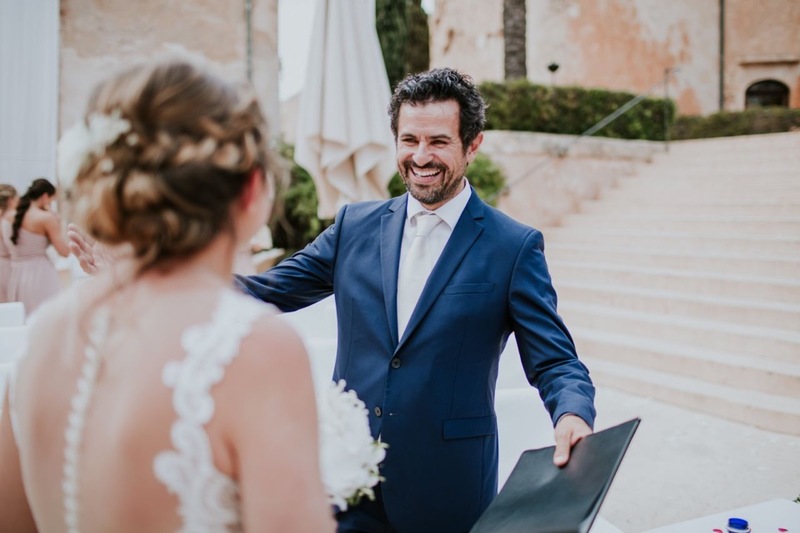 Can you describe a normal wedding day in your life as a wedding celebrant? Where is your favorite wedding location? Anywhere in Mallorca, you name it! Under the sun, at an authentic Finca, by the sea or lost in between the mountains..gosh, how many years till my wedding vows renewal?! Share a funny story from one of your ceremonies?